Home Local News Bagong Pasabog ng WAC! Isiniwalat kung paano ginamit nila Aquino ,Roxas at iba pa ang DAP para sa 2016 Election! Bagong Pasabog ng WAC! Isiniwalat kung paano ginamit nila Aquino ,Roxas at iba pa ang DAP para sa 2016 Election! Isiniwalat ng Grupong Anonymous ng page "We are Collective" kaugnay sa di umanoy paggamit nila sa DAP para sa eleksyon noong 2016. As per their recent post, sangkot sina ex-President Noynoy Aquino, ex-DILG chief Mar Roxas, ex-Budget secretary Butch Abad, et al. sa paggamit ng DAP para sa 2016 Election. Remember DAP? Dahil hindi matanggap at na shock si Mar na malakas si Binay sa mga LGU, ginamit nila ang DAP para mapalakas sila sa mga LGU at makontrddda si Binay sa 2016. They allocated 6.5 billion from the DAP fund for what is essentially a pork barrel scheme - practically a giveaway for local governments down to the municipal level. In short, they were setting up the fund to boost their prospects in 2016, kung saan tatakbo si Mar pagkapangulo under LP. 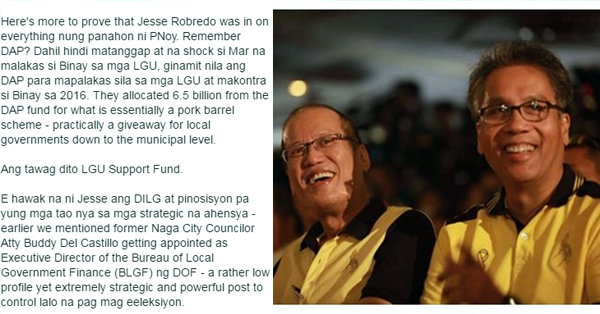 Here's more to prove that Jesse Robredo was in on everything nung panahon ni PNoy. Remember DAP? Dahil hindi matanggap at na shock si Mar na malakas si Binay sa mga LGU, ginamit nila ang DAP para mapalakas sila sa mga LGU at makontra si Binay sa 2016. They allocated 6.5 billion from the DAP fund for what is essentially a pork barrel scheme - practically a giveaway for local governments down to the municipal level. Ang tawag dito LGU Support Fund. E hawak na ni Jesse ang DILG at pinosisyon pa yung mga tao nya sa mga strategic na ahensya - earlier we mentioned former Naga City Councilor Atty Buddy Del Castillo getting appointed as Executive Director of the Bureau of Local Government Finance (BLGF) ng DOF - a rather low profile yet extremely strategic and powerful post to control lalo na pag mag eeleksiyon. According to an investigative report by Bobby Tiglao, the fund was "disguised as something intended to augment the internal revenue allotments of provincial and municipal governments which had fallen because of national government shortfalls in its revenues. The annual budget approved by Congress actually has a regular allocation for the LGU Support Fund of Php 200 million." Magkano inallocate ni PNoy from DAP? A total of Php 6.5 billion, disbursed practically at the discretion of Abad and DILG Secretary Mar Roxas, na pumalit kay Jesse nung namatay sya. What indicates an anomalous irregularity though, is that the COA's audit reports of the DILG for 2011 and 2012 do not contain any reference at all to this P6.5 billion LGU Support Fund coming from the DAP, according to Tiglao. E buhay pa si Jesse nung mga panahong ito. Sponsor Tiglao states further, "The only reference to DAP funds was in the 2012 audit which reported that out of the P1 billion given to the so-called 'Performance Challenge Fund' for local governments - in essence another form of pork barrel, disguised as awards for good governance by an LGU - P253 million came from the DBM's 'Disbursement Acceleration Fund.'" According to Abad's memorandum to Mr Aquino dated on October 12, 2011 which in effect set up the DAP after the President's signed approval, other projects it would fund would be "DPWH: Various Infrastructure Projects" for P5.5 billion and "Other local projects" for P6.5 billion. Since it would be entirely at Abad and Aquino's discretion what these "other projects" would be, the funds obviously could be used as bribes for political leaders in whose district or area these will be implemented. In short, they were setting up the fund to boost their prospects in 2016, kung saan tatakbo si Mar pagkapangulo under LP. And Jesse is his "bastonero" so to speak. E nung nadedbol si Jesse wala choice si Mar kundi pumalit dahil walang ibang mapagkakatiwalaan sa mga ihinanda nila. Dumating pa yung Yolanda, mas malaki pa pera nakulimbat nila for their election war chest. Kung hindi pa pumiyok si Jinggoy na nasuhulan sila ng tig 50 million pesos para iconvict si Corona e di pa sisingaw yang DAP na yan - na napakaobvious na gagamitin nila sa eleksyon.